The Guardian reports that Downing Street is not happy about how Boris and his team gave the Telegraph their story about the estuary airport, and how this has backfired by producing a united and concerted opposition from the Lib Dems. It is thought that the Lib Dems will support a consultation by Justine Greening on how to maintain a hub airport, but they will oppose any new airport. Boris and some business people persist in pushing the line that the UK must have a huge airport in order to compete with European countries (which in turn build larger airports to compete with London), and that this is the only way in which the UK can get flights to lesser known Chinese cities. The only attraction for the government of a massive airport project would be the hope of large numbers of attractive jobs for years. Downing Street told Boris Johnson on Wednesday that he had killed off any moves towards an airport in the Thames estuary ahead of the next general election after an announcement by the London mayor was seized on by the Liberal Democrats. David Cameron and George Osborne, who have become alarmed by growing business anxiety about their opposition to expanding Heathrow, had indicated they were warming to the idead of a new airport which would assume Heathrow’s role as a hub. But Johnson was told that he had handed a gift to the Lib Dems, who are opposed to any airport expansion in the south-east, when he briefed the Daily Telegraph that Downing Street had signed up to his proposal. The Lib Dems will support a consultation by Justine Greening, the transport secretary, on how to maintain a hub, but they will oppose any new airport. Johnson was upbeat on Wednesday evening, after he outlined his plans to a meeting of the Conservative party’s 1922 committee. “We must not count our chickens or over-egg this – to continue with a chicken metaphor – [but] the government is still looking at all the options. The proposed airport would be an international hub that could open up new routes to south-east Asia and have capacity for connecting flights. At present, the British aviation industry says the nation is losing out to rivals airports such as Schiphol in Amsterdam and Charles de Gaulle in Paris. The government has ruled out a third runway at Heathrow, as has Labour since leaving power, a current political reality that has been reluctantly accepted by the industry. Colin Matthews, the chief executive of airports operator BAA, said he was “pleased there was an acknowledgement that there was a need” for more airport capacity, but it would take decades to construct a whole new airport. Greening, however, has also ruled out further runways at Gatwick and Stansted in answers to parliamentary questions. Heathrow, he said, was “fundamentally in the wrong place”. He said listening to the “Heathrow recidivists” who argue that other options for airport expansion take too long would only lead to paralysis. In his autumn statement, Osborne indicated the government would consider all options for airport expansion, which he sees as an opportunity for economic regeneration. The architect Norman Foster has drawn up plans for an airport on the Isle of Grain, the easternmost point of the Hoo peninsula, with four runways and which could handle 150m passengers a year – double the current number passing through Heathrow. It is the latest in a range of proposals dating back decades for the estuary, including a mooted “Boris Island” airport at nearby Shivering Sands. Aircraft would, however, have to contend with the multitudes of birds that flock in the area – a hazard to aviation and an issue that has brought opposition from environmental groups. The RSPB said it was a vital habitat for wildfowl and wading birds. Balpa, the pilots’ union, said it would seek reassurances on the dangers posed by birdstrikes, as well as potential air traffic conflicts with Brussels, Heathrow and London City airports. 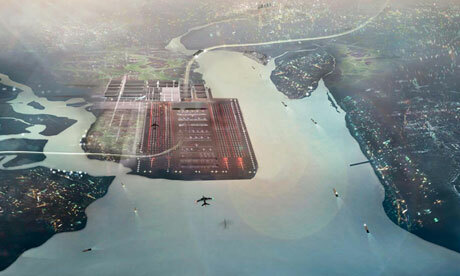 T Cameron is expected to offer his provisional support to Boris’s estuary airport scheme. He is now thought to back the project, though he was initially against it. The Thames airport proposal will be in the government’s aviation policy consultation that starts in March, though Downing Street says the government will make a final decision on the basis of the consultation process. This announcement may have been intended for earlier in the month, and may have been delayed by doubts by Nick Clegg. The Lib Dems used to have a policy to oppose airport expansion. Since we have committed to spend £32 billion on HST, there isn’t a lot of spare money for other projects. Posted: Wednesday, January 18th, 2012. Filed in News about Airports, Recent News.